This entry was posted on March 3, 2018 by Woven Monkey. 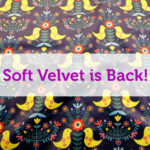 We know some of you have been waiting patiently for our Soft Velvet to be back in stock. Well I'm pleased to say it's now available again to purchase through the website. Those of you who've ordered this fabric before will notice it's slightly lighter than our old version, with it being 265gsm, compared to 280gsm. However, it still has the same great feel as our old Soft Velvet, and is at the same fantastic price of just £27.99 per metre.